Amazon Price: $35.10 $25.11 You save: $9.99 (28%). (as of October 18, 2017 6:36 am - Details). Product prices and availability are accurate as of the date/time indicated and are subject to change. Any price and availability information displayed on the Amazon site at the time of purchase will apply to the purchase of this product. Display esteemed elegance while wearing this Silver Multistrand Cameo Necklace. 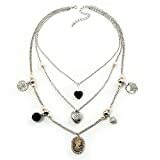 Featuring a 3 strand design, crafted in silver tone metal and decorated with charms: a crystal cameo with female profile, a little fairy, a crystal and metal puffed heart and pearl and metal beads. All charms evenly spaced on each strand. The longest strand measures about 64cm in length, the shortest is about 42cm in length. It fastens with an adjustable lobster-claw clasp for a comfy fit. This is truly a unique and elegant piece of jewellery and will grace any outfit for that perfect evening to give a touch of class and style.